The key to the coffee and tea market is the exclusive and specialty offerings provided by the various tastes, colors and aromas of the various types of teas and coffees that are available to the end consumer. The preservation of these key elements is a prerequisite of coffee and tea producers everywhere. Layfield can customize your package with one-way valves, propriety film structures and high definition printing capabilities so your products can stand out on the shelf. 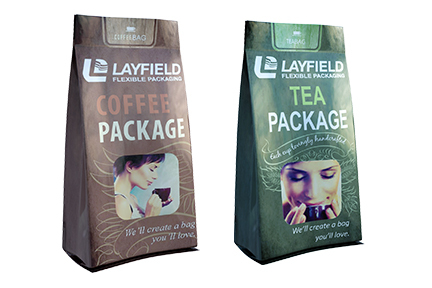 Coffee and tea packaging materials offered by Layfield have an excellent retention power, which keeps the flavour, color and aroma of tea and coffee intact while providing barriers against dampness, dust particles and other contaminants. We can help with your brand image by providing eye-catching printed packaging which stands out on the retail shelf, and will appeal to the end consumer.